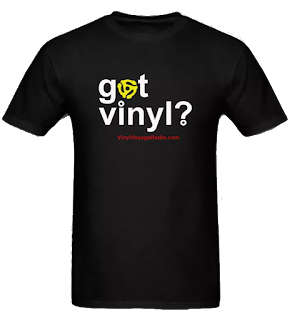 Did you miss any episode of Adventures in Vinyl? Here is your chance to catch up. On Memorial Day, starting at 10 am CT, we will be broadcasting the last four episodes in a row---about 5 hours or so of nothing but pure K-Tel. Adventures in Vinyl is the only show dedicated to the lost art of the K-Tel record compilation. Join us for a nostalgic trip to the past. Well, we made it---much to the dismay of Harold Camping and his minions who believed the world was to end on May 21. I actually somewhat feel sorry for them. Not that I wanted the world to end, but I can't imagine what it must be like---sitting and waiting for something that you are so sure is going to happen. And watch it pass by. I can honestly say, I do not know what that is like. Is it like learning there is no Santa Claus? I don't actually remember that moment---it probably wasn't a moment, but a gradual realization. Not the same thing at all. So, no. I have never believed in something so heartedly that I was willing to quit my job and give up everything: money, friends, all possessions---all for a belief that was not to happen. Bummer. This whole thing reminded me of a song (of course, this is The Vinyl Voyage, after all). The Eurogliders released "Heaven (It Must Be There)" in 1984. Formed in Australia in 1981, this song was really their only hit to reach the U.S. charts. It peaked at #26 that year. The Eurogliders never became much here in the States. Probably wanted to make it big here, though. A modest hit, "Heaven" was not to draw attention to the band like it did in their native Australia. The band broke up shortly after. In 2005, they reformed. Briefly. Their new album failed to produce any hits and they broke up again. Perhaps this song nicely summarizes the band's existence. This could be Harold Camping's theme, actually. Nothing like a feel-good, hopeful pop song to make one forget about the anticipated--but misguided---apocalypse. "Heaven" is just one of the songs that can be heard on the Vinyl Voyage. We stream an eclectic mix of music 24 hours a day. And all of it on glorious vinyl. Just as music should be. Dynamite is one of the better K-Tel record compilations. It was the album that introduced me to Eric Clapton, Elton John and Al Capone. With the forces of the law. You remember that song: "The Night Chicago Died," a one-hit wonder by British band, Paper Lace. I loved that song. 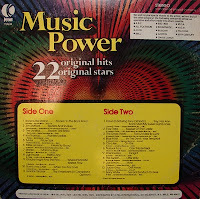 It was the song that I played most from Dynamite and it opens side one of this 20-track album. Much of the song is historically inaccurate ("East Side of Chicago?"). I can say that with confidence because my real job is that of a history teacher. In fact, when I discuss prohibition and the 1920s, I always play it for my students. And I may sing a little as well. And perhaps dance a bit. They look at me usually with horrified expressions. But at least it exposes them to Paper Lace. What's more important than that? I just hope that somewhere down the line when they hear that song later in life they think of me. That's really what it's all about. I was 6 years old in 1974. I don't remember getting the album...but I do remember playing it. And I'll be playing the album in it's entirety this month on Adventures in Vinyl---the only radio show dedicated to the lost art of the K-Tel record compilation. 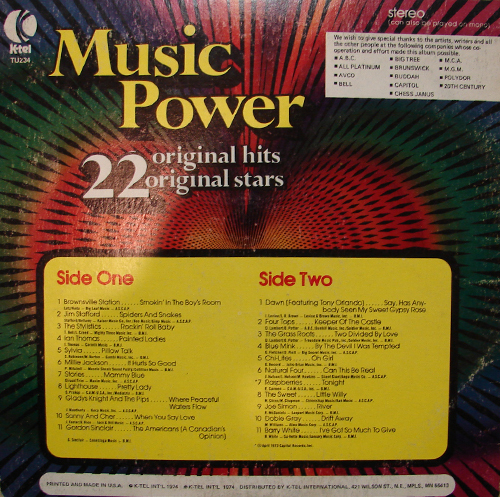 Every month we highlight a particular K-Tel album. 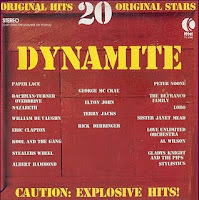 And this month, it is Dynamite, played from its original vinyl. Adventures in Vinyl airs on Saturday mornings, 11 am (ct) and Sunday afternoons at 4 pm (ct) only on Vinyl Voyage radio. Remember this one? It's from 1984 and MTv played the hell out of it. Nik Kershaw had his first (and only) U.S. hit with "Wouldn't it Be Good." In the video, he plays an alien with a white suit that is actually a very poorly designed green screen that begins to play images from his life on earth. Make sense? Not at all. But this is classic 80s---a time when videos dominated the music industry and attempts were being made to make the videos more movie-like; often-times telling stories that have nothing to do at all with the lyrics of the song. This video falls into that category. 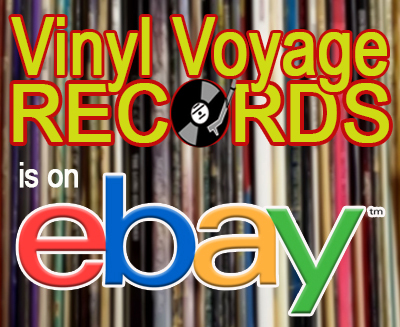 Tune in to the Vinyl Voyage for an eclectic mix of tunes spanning the last several decades, all on glorious vinyl. Including "Wouldn't it Be Good. We stream music 24/7--commercial free during the day. Tune us in.